James’ reflections were noted by Leo Marx in the closing chapter of his classic, The Machine in the Garden: Technology and the Pastoral Ideal in America . First published in 1964, The Machine in the Garden is a rich, absorbing study of the tension between the pastoral ideal and the intrusion of machine technology throughout American history. In the first part of the work, Marx explains how, soon after the European discovery of the New World, the pastoral ideal was seized upon to describe America. Thomas Jefferson in particular translated what had been a literary construct into “a guide to social policy.” America was to be a society wherein the opposition between nature and civilization was resolved in favor of a delicately balanced, harmonious relationship; it was not a wilderness, but a garden. America’s quasi-mythic self-understanding, then, included a vision of idyllic beauty and fecundity. But this vision would be imperiled by the appearance of the industrial machine, and the very moment of its first appearance would be a recurring trope in American literature. It would seem, in fact, that “Where were you when you first heard a train whistle?” was something akin to “Where were you when Kennedy was shot?” The former question was never articulated in the same manner, but the event was recorded over and over again. In Marx’s view, the recurring vignette describing the startled recognition of the machine’s intrusion into the pastoral ideal was an American adaptation of the traditional “pastoral design.” The pastoral design was a literary convention with roots in classical antiquity. Within the pastoral design, the pastoral ideal of the harmony between man and nature, positioned between civilization on the one side and wilderness on the other, is troubled by the intrusion of some “counterforce” which signals the larger reality within which the pastoral ideal is played out. The gesture is made visible in the landscape paintings of the 17th century that introduced some momento mori into the idealized scenery. It is, for example, spelled out by Poussin when his shepherds stumble upon a grave with the inscription, “Et in Arcadia Ego.” Within the pastoral design, impinging disruptive forces always trouble the pastoral ideal. The train whistle became, for a certain generation of American writers, a memento mori signaling death’s presence within the pastoral ideal of America. This ideal, however, was not eradicated by the industrial revolution. It was still alive in the imagination of Henry Adams, even if it appears more self-consciously quaint unto itself. Well into the 20th century, the artistic conventions of the genre are still visible, even in the technocratic vision of Charles Sheeler. 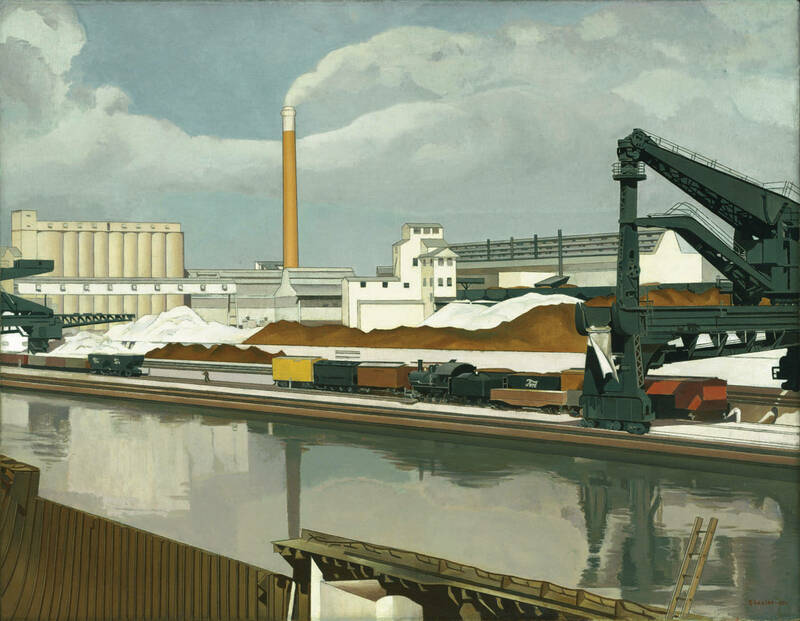 It is useful to contrast Sheeler’s painting with an older attempt to harmoniously represent a new order which encompasses the machine into the ideal. 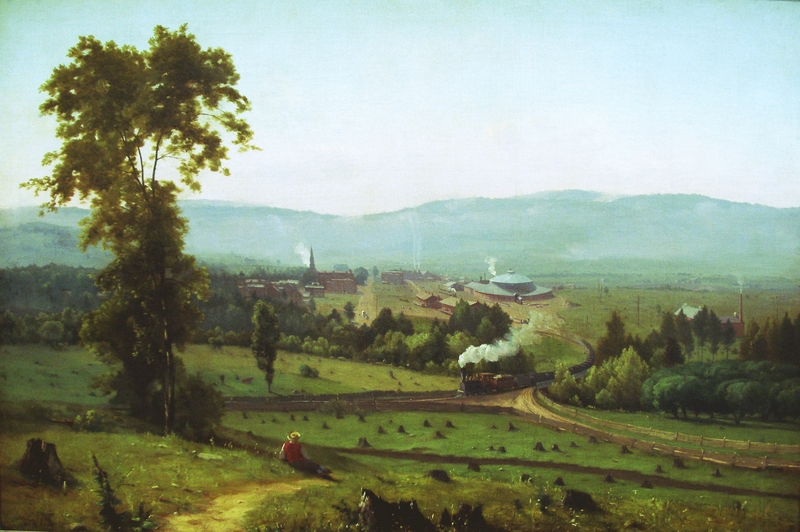 In “The Lackawanna Valley” (1855), George Innes depicts a more traditional landscape, but he has incorporated the machine into the scene, both by the presence of the train winding its way toward the foreground and the smoke rising from the mills or factories further in the background. Setting Innes and Sheeler side by side, creates a suggestive illustration of the evolution of the machine’s place within the pastoral ideal of American society. What was for Hawthorne, Melville, Thoreau and others of their generation a potentially destructive intrusion into the pastoral ideal, is first assimilated into the ideal and then transfigures the ideal into its own image. It is no longer the industrial machine that has entered the garden, it is now the smartphone. In that book, I never took Marx to be saying that most people saw technology as a threat to the pastoral ideal. Well, there was that, but along with it was a reverence for the technology of industrialization. Technology was framed as an awe-inspiring example of inevitable progress and the conquering of nature by the intellect of man. That was the technological sublime rhetoric that surrounded technology, the belief that advances in technology would lead to a better life for all, and any negative consequences of industrialization, like those seen in Europe, would be kept at bay by the purity of the new world that was America. So the longing for a pure pastoral ideal was more European than American. Here, we combined that pastoral ideal with a reverence for technology: advances in technology, which are seen as proof of our superiority, would help us reach utopia. I see the same somewhat contradictory rhetoric around digital technology: It promises to usher in an age of participation and equality, but it also threatens to destroy community. And people seem to have an inability to take these feelings down to earth and realize that digital technology can do both depending on how it’s made and used. The dystopian rhetoric and the utopian rhetoric both dominate somehow, with a dearth of rational discussion. Advances in war technology sometimes follow this pattern, too. Because advances mean destruction becomes greater and easier, we fear we’ll obliterate civilization, but at the same time, we hope that knowledge means we’ll never use the most horrible weapons, so somehow they’ll usher in world peace. Yes, the technological sublime (David Nye, et al) was the more common attitude toward technology, no question about that. Marx himself does make clear that the literary tradition that recoils at the incursions of the machine is a minority position in American culture. I probably should’ve made that clearer, in any case I clarified at the start of the follow up post. And the garden, even for the dissenters from the majority opinion, is not bereft of technology — it’s just found the proper balance. And yes, the connection with present debates about digital technology is exactly where I want to take this in the follow up posts (you can tell me how well I pull off the connection) and hopefully provide some rational discussion.